There is no shortage of options to choose from when it comes to selecting a ferry from Saronic Islands to Greece. There are 4 ferry companies with a combined offering of 22 Ferry Routes connecting Poros (Saronic Islands) to Piraeus, Aegina to Piraeus, Agistri & Agistri Myli, Agistri to Piraeus & Aegina, Hydra to Piraeus, Ermioni, Poros (Saronic Islands), Porto Heli & Spetses, Spetses to Piraeus, Ermioni, Hydra, Porto Heli & Poros (Saronic Islands), Aegina to Piraeus, Agistri & Agistri Myli, Agistri to Piraeus & Aegina, Hydra to Piraeus, Ermioni, Poros (Saronic Islands), Porto Heli & Spetses, Poros (Saronic Islands) to Piraeus, Ermioni, Hydra, Porto Heli, Spetses, Aegina & Methana, Spetses to Piraeus, Ermioni, Hydra, Porto Heli & Poros (Saronic Islands) & Hydra to Piraeus, Ermioni, Poros (Saronic Islands), Porto Heli & Spetses. The fastest route between Saronic Islands and Greece is Aegina to Agistri with a crossing duration of around 10 minutes. With so many routes on offer we make it simple by comparing all similar routes in one search so you can quickly find what you are looking for. 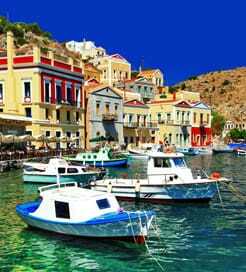 The Saronic Islands are a Greek archipelago just off the Peloponnese peninsula in the Aegean’s Saronic Gulf. 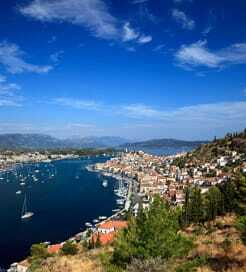 Situated close to Athens, these islands are popular amongst Greeks for daytrips and weekend getaways. Comprising Salamina, Aegina, Poros, Hydra, Spetses, Dokos and Agistri, each island has a unique feel. Aegina has spectacular temples and historic sites, Angistri is blanketed by lush forests and offers total tranquillity, particularly outside the high season, Salamina has a port dating back to the 4th Century, while the others boast exquisite beaches, idyllic towns and hidden coves speckled along the coastline. The Saronic Islands are extremely well served by ferry, offering frequent, high-speed sailings every day to numerous locations on the Greek mainland. There are also plenty of ferry routes within the archipelago itself, all operated by one of the country’s leading ferry companies.